"You can do it, Dumbo. Show them." Disney has revealed their first full-length, official trailer for the live-action Dumbo movie, about the little elephant who can fly. And you'll really believe he can fly after this! What a magnificent trailer, no thanks to that music. Dumbo is directed by iconic filmmaker Tim Burton, who has been working with Disney ever since Alice in Wonderland and most recently made Miss Peregrine's Home for Peculiar Children. This new Disney Dumbo adventure features an exciting ensemble cast: Danny DeVito, Eva Green, Colin Farrell, Nico Parker, Finley Hobbins, Alan Arkin, Joseph Gatt, Sandy Martin, with Michael Keaton as the evil entrepreneur villain. Well what do you know, this looks really wonderful. Surprise, surprise, Disney making more magic that will get you into theaters and buying tickets. This looks adorable, upsetting, and inspiring in all the ways only Disney knows how to be. Fly, Dumbo, fly. You can still watch the first teaser trailer for Disney's Dumbo here, to see the original introduction again. This new, live-action grand adventure Dumbo expands on the beloved classic story where differences are celebrated, family is cherished and dreams take flight. 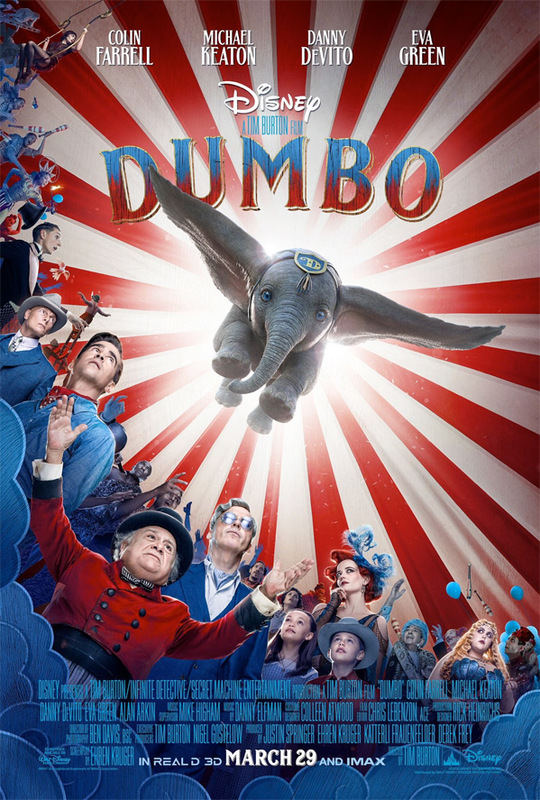 Circus owner Max Medici (Danny DeVito) enlists former star Holt Farrier (Colin Farrell) and his children Milly (Nico Parker) and Joe (Finley Hobbins) to care for a newborn elephant whose oversized ears make him a laughingstock in an already struggling circus. But when they discover that Dumbo can fly, the circus makes an incredible comeback, attracting persuasive entrepreneur V.A. Vandevere (Michael Keaton), who recruits the peculiar pachyderm for his newest, larger-than-life entertainment venture, Dreamland. Dumbo soars to new heights alongside a charming and spectacular aerial artist, Colette Marchant (Eva Green), until Holt learns that beneath its shiny veneer, Dreamland is full of dark secrets. Dumbo is directed by filmmaker Tim Burton, of the films Beetlejuice, Batman & Batman Returns, Edward Scissorhands, Ed Wood, Mars Attacks, Sleepy Hollow, Big Fish, Corpse Bride, Sweeney Todd, Alice in Wonderland, Dark Shadows, Frankenweenie, Big Eyes, and Miss Peregrine's Home for Peculiar Children previously. The screenplay is written by Ehren Kruger. Disney will release Dumbo in theaters everywhere starting March 29th, 2019 early next year. How's that looking?